Last night, Apple launched a first developer beta of iCloud.com, a set of web apps based on the iCloud functionality originally introduced in iOS 5 beta that mimic the appearance of Apple's Lion desktop apps like Address Book and iCal, or the Mail app for iPad. The new web apps, seen as replacements for MobileMe's existing web offerings, have been completely rewritten to take advantage of iCloud's faster and invisible sync of content between devices, and they also include a new web-based version of iWork that, however, isn't live yet. Screenshots (and videos) of the iCloud web apps have surfaced online and partially on Apple's website too; early screenshots of the login page had been leaked ahead of the WWDC in June. The iCloud web apps provide an alternative to their iOS and OS X counterparts -- being entirely web-based, they can come in handy "if you happen to be away from home without your computer or one of your iOS devices" so that "you can access your mail, contacts, and calendar — ad-free — from any computer at icloud.com". These upgrades, Apple confirms, will be in addition to the 5 GB you get when you sign up for iCloud. Extra storage can be purchased "right from your device", using the same Apple ID you use for iTunes Store purchases. Below, we've collected the various iCloud pricing schemes Apple has detailed on its international websites (or through the iCloud settings panel on iOS 5 beta), and compared them to Dropbox, a popular service among Mac and iOS users that allows you to keep files and folders in sync across computers and devices inside a "Dropbox" folder on your computer or mobile application. Apple was rumored multiple times in the past to be the perfect buyer for Dropbox, which offers a service similar to iDisk conceptually (it's just a folder on your computer that syncs with the cloud), but as the WWDC revealed the company seems more interested in a seamless solution to store and push content, rather than manually manage it. In Dropbox, you still have a filesystem and files to move around; Apple's iCloud, on the other hand, doesn't need (or want) a filesystem at all. In Apple's vision, apps -- not folders or files -- live as entities on the cloud, and users don't have to worry about anything but using them on their devices. iCloud becomes invisible once it's set up, whereas Dropbox still requires some kind of management. For this reason, comparing iCloud to Dropbox might not be exactly accurate. However, as we have seen in the past months, users and developers have come up with new uses for Dropbox (thanks to an API) by relying on it as an "invisible" syncing platform for apps and databases. There are hundreds of apps for iPhone and iPad that sync their content with Dropbox, but unlike this widely used service, Apple doesn't seem to be willing to re-introduce a filesystem-based storage option for iCloud. Apps will take advantage of iCloud's document and data storage to sync their files across devices, but Apple isn't likely to integrate a new iDisk-like option in iCloud. Furthermore, cloud-based syncing services don't offer all the functionalities seen in iCloud, such as native contact and calendar sync, location-based device tracking, or webmail. 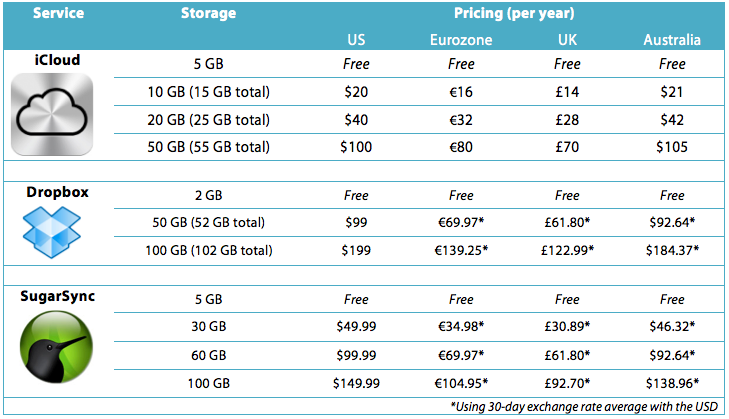 The chart below takes a look at the storage you can buy from Apple, and two other popular file sync services. We've also taken in account pricing plans from SugarSync, another "online backup, file sync and sharing service" similar to Dropbox. In spite of Apple's website reporting new storage upgrade options since yesterday, iCloud is still in beta and prices may change come the public release of the service. iCloud is expected to make its debut this Fall, with rumors pointing at a September public launch following Apple's usual music event.